I may have broken the junction system in Final Fantasy VIII. I've beaten the first disc, my characters are still around level 12, and I can usually one-shot bosses. Let me explain. Going back to this game was intimidating because the Junction system is so complex. I knew that I never really grasped it last time I played so this time I did research before playing. Here are the basics. This paragraph may hurt your brain, don't feel bad about skipping to the next one. Your character only has one command (Attack) unless you junction a Guardian Force (GF). Guardian forces are summons, but they also grant you commands, abilities, and let you junction magic as long as they're junctioned to you. Commands that can be equipped are things like Magic, Item, GF, Mug, Card, Draw and others. These let your characters actually do things other than attack in battle. Now that a GF is equipped you can junction magic! But first, you need to acquire magic through drawing or refining. Draw is a command that lets you pull magic out of enemies and store it. It's slow and tedious. You can also refine magic from items. That's less tedious, but still time consuming. Often, to get the items you want so that you can refine the magic you're after you will need to play the card game or turn enemies into cards. Anyway, now you have some magic, good job. Once you have some you can junction that magic to a character stat and increase that stat. If you use any of that magic it will be pulled out of your reserves and it will have less of an affect on that stat. An example I found of someone junctioning magic to stats. The way I started to break the game is by realizing that increased stats have a much larger impact at low level. So, I went about collecting as much magic as possible and junctioning it while avoiding as much experience gain as I could. My characters who have a base HP of around 500 at their current level now have around 3000. They used to hit for 70ish damage until I junctioned powerful magic. Now they hit for 1k-2k damage. I think I broke the junction system a bit. I actually ended up playing the in game card game, triple triad, for many hours. I did this to experience the card game but also to acquire cards that I could refine into even better magic for junctioning. I had a ton of fun digging into this system. I actually spent about 6-7 hours just trying to accomplish magic acquisition and juntioning without pushing the story forward at all. I love digging into intricate systems, so it was a fun challenge for me. Now I'm cruising through the game enjoying the story and destroying everything in my way. 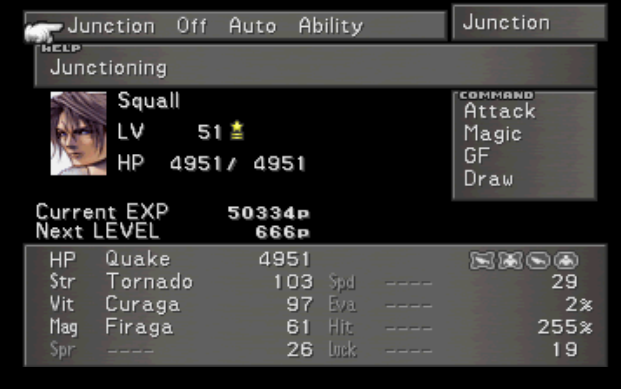 It also helps that I picked up an ability that changes the random encounter rate to 0. Basically, I play through the story and only have to fight bosses now. Which I usually 1-shot. Because of all this, I'm just flying through the story now. I'm onto disc 2 (of 4) and I'm really enjoying the presentation. The modeling and animation are much improved over Final Fantasy VII and the FMVs are better incorporated. A lot of the transitions are seamless between gameplay and FMV. The overall story still feels like it's very early even though I'm on disc 2. I like the setting and the general plot so far, but I don't feel like I've played enough to talk about the overarching story. I'm finding Final Fantasy VIII to be fairly fun. In some ways it's better than FFVII and in some ways it's worse. I need to get more playtime under my belt before I make any sweeping generalizations. The FMV integration really is a step up, and one of the things I like about VIII. I love that such is possible, to be honest. VIII really demands a different approach than the "usual" FF game play. You can play it like you play the others, leveling and grinding, but it actually hurts you a bit. Bosses not only level up with you, but they gain new abilities at set levels, so they take big steps up in threat level. If you can use Junctions to be super powerful while denying the enemy their levels (the only way they get stronger), you can breeze through the game. So... like other FF games, it's possible to break the game and overpower the baddies, but you have to come at it sideways in VIII. On the one hand, that did frustrate the reflexive "grind and gather" mentality I had after finishing VI and VII, but when I took VIII on its own merits, it wound up being fairly fun. It's not my favorite in the series, but I appreciate that Square was trying new things. That doesn't always pan out, but I'll take that over "more of the same" game design. There are always things I'd have done differently, but VIII is still a good game, I think. It gets a bad rep for being so weird with its mechanics, some of which is deserved, but I think some of that is unfairly based on the fact that it doesn't behave like the other entries in the series. I actually love that it's different. After playing through 7 Final Fantasy games in a row where the key to winning was leveling, this is a nice change of pace. The junction system is confusing at first but actually really interesting once you get into it. I've never done a low-level run before, but I think I'm going to stick with my current strategy for this run through and keep my levels as low as possible.